This is the first installment of Project 24, a series that documents the lives and work of millennial artists based in New York City. As a collection, these portraits explore how the latest generation of contemporary artists operate in their relative intersections, navigate New York's dynamic art scene and adopt hybrid forms of visual expression. For other artists on our radar be sure to check out HuffPost Arts. 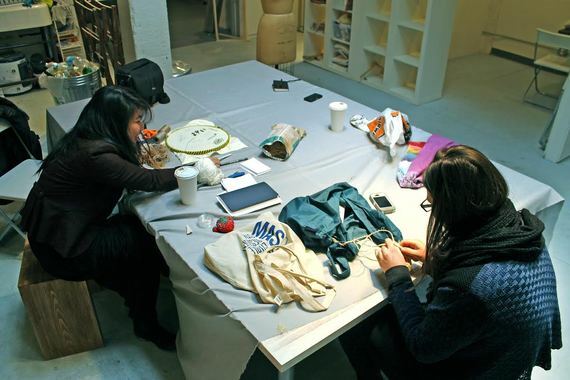 Nguyễn Chi is an "artist seeking relevance." An accurate description (one she invented for herself), but it begs the question: Relevant to whom? It's hard to say -- so much so that she's even dedicated a blog to finding the answer. In the meantime, she knits. Tucked along the fringe that stitches Bedford-Stuyvesant and Clinton Hill together is an inconspicuous walk-down cafe named Bedford Hill Coffee Bar. A neighborhood favorite, its patrons are a medley of Brooklynites and Everybody Else; Nguyễn belongs to the latter. But in her experience, it's a membership she carries everywhere she goes. 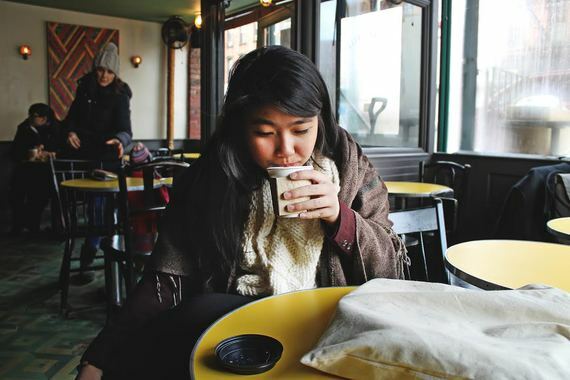 Nguyễn is a perennial foreigner, stranger to every land and citizen of none. 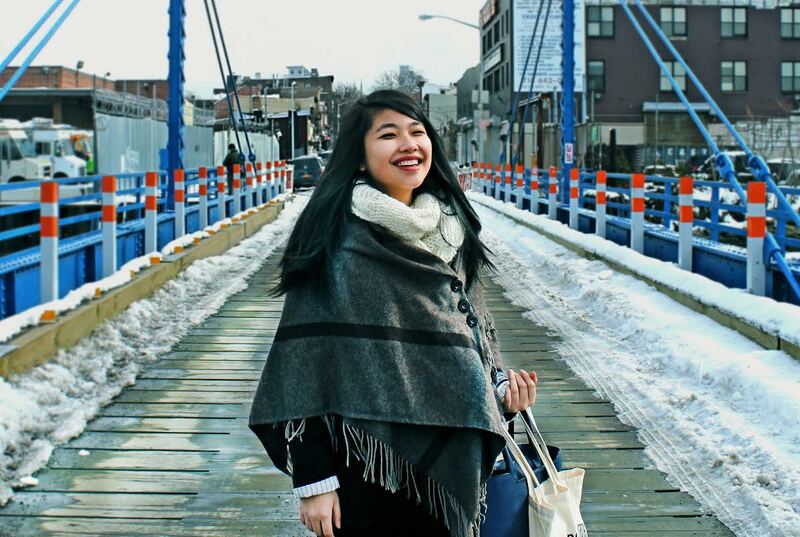 Hailing from Vietnam, she immigrated to New York when she was twelve, clueless of all things America (language included). But the social pressure to conform is a very real and powerful force, one that Nguyễn is deeply acquainted with. Before long, she learned to speak English with remarkable fluency, accent-free. Her diligence as a student of this new world earned her success by all of the country's standards. But the acquisition of the American culture came at the price of her roots. And in retrospect, she acknowledges this sacrifice as a painful trade-off. Over an Americano, that indistinct fusion where Italian espresso meets diner brew, she tells me about a recent visit to her homeland. "I realized that I don't speak for the Vietnamese people anymore." Now Nguyễn is working to reclaim the heritage she once labored to renounce. From her decision to knit -- an art her family practiced during the Vietnam War -- to changing her Facebook name to Nguyễn Chi (as opposed to Chi Nguyễn), her past has become the focal point of her endeavors. We make way for her studio in Gowanus. To engage her in conversation is to enjoy the pleasures of a kind of 60s-style finesse. In the manner that she does, breaths generously spaced apart and words carefully selected, she tells me about her life after graduation, characterizing it as "nothing short of a dream." On weekdays she earns a living as a nine-to-fiver at the School of Visual Arts. Every other moment is dedicated to her work in the studio. 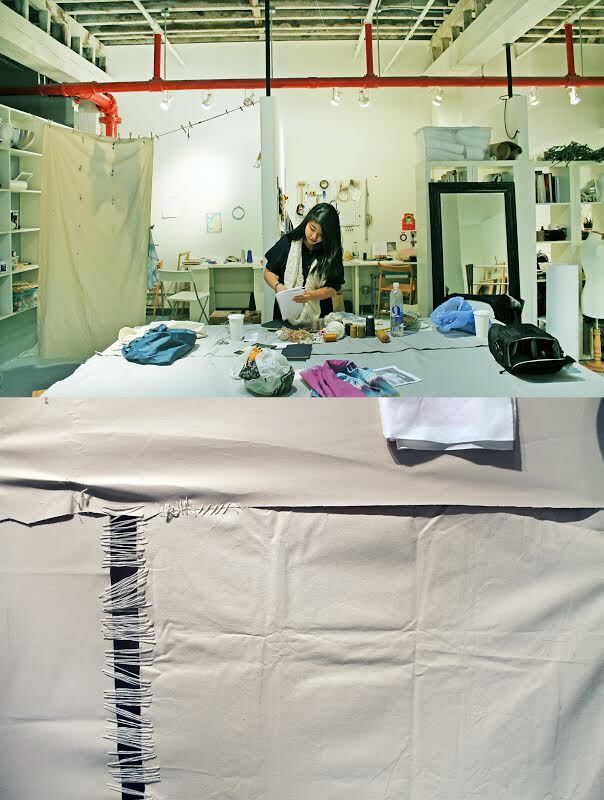 At the recommendation of an advisor and professor at Macaulay Honors College, Nguyễn secured a residency at the Textile Arts Center in Brooklyn. She's slated for a group exhibit this summer. The commute yields intimate talks about the people in her life: her two roommates, a soulmate that lives in California, and her mother, best friend and parent all in one. Then a little ways past the Carroll Street Bridge, she stops and turns my attention to a piece of graffiti. It reads: "We Will Not Forgive Them." "How painful," she says. The studio is an expansive loft-style space. A large communal table stands in the center, anchoring the artists' private compartments on either side. Hers is the first right from the entrance. At times provocative but almost always political, Nguyễn's body of works possesses an intelligent, forthright awareness of the conversations they're intended to address. Not one to divorce her emotions from work, she imparts an intuitive quality informed by her experiences that traverses the full gamut of her mediums: From oil paintings to knit-work, the execution is confident, bold, and exceptionally Nguyễn-esque. Self-contained her final pieces bear clear messages, each appealing to as many layers of intellectual consideration as she chooses to instill in any given piece. But informative as they are, the crux of her artistic contribution isn't fully disclosed in these final products. As a process artist Nguyễn derives greater value from the moments leading up to a work's completion. From war narratives to gender studies, she immerses herself in the literature of her subjects -- and she's indiscriminate in her search for information. Her treatment of all accounts is consistent with her life philosophy: "Who am I to judge?" 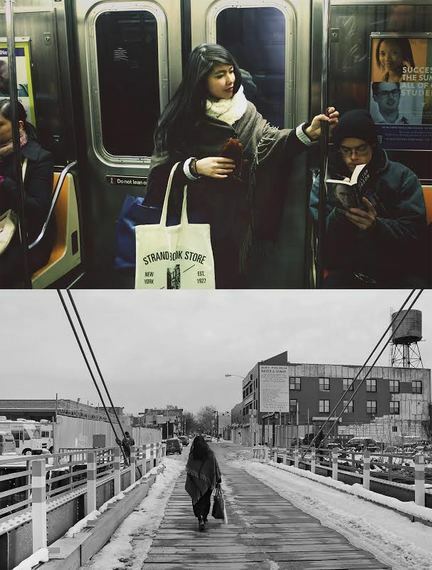 She records these journeys every step of the way. Eventually I invite her for a walk. Despite the allure of fresh air and a moment of respite, she politely declines. "Once I'm in the studio, it's impossible for me to leave. I just really get into the work." It's a meditation she refuses to break for hours on end. In this case, she's forcing her will on a strand of discarded yarn that won't stretch. Nguyễn is at a sensitive juncture in her life, one that finds her looking to the past for both forgiveness and permission so she can forge a future free from regret. But in doing so she's already claimed a new, divergent path that explores the unchartered space -- however narrow the line may be -- that exists between many discrete worlds: Vietnam and America, heritage and society, past and future. Here, at this nexus, boundaries are renegotiated, grievances are forgiven, and gaps between disparate realms are woven together. Nguyễn may no longer feel relevant to the Vietnamese people. Nor is she relevant to the American people. But she is relevant, and her actions, whether intentionally or not, start a conversation that others like her can enter. In this shared space, similar hybrid identities who are at once estranged from their past and outsiders in their present are afforded the comfort of camaraderie. The promise of a new home may be miles ahead, but Nguyễn is showing the way. The yarn stretches. She smiles and forms another loop. "I know my limits and I always try to break them." She says. "How symbolic, the limit does not exist." To learn more about Nguyễn, head on over to her official website. But before you do, be sure to watch her interview in the video below.